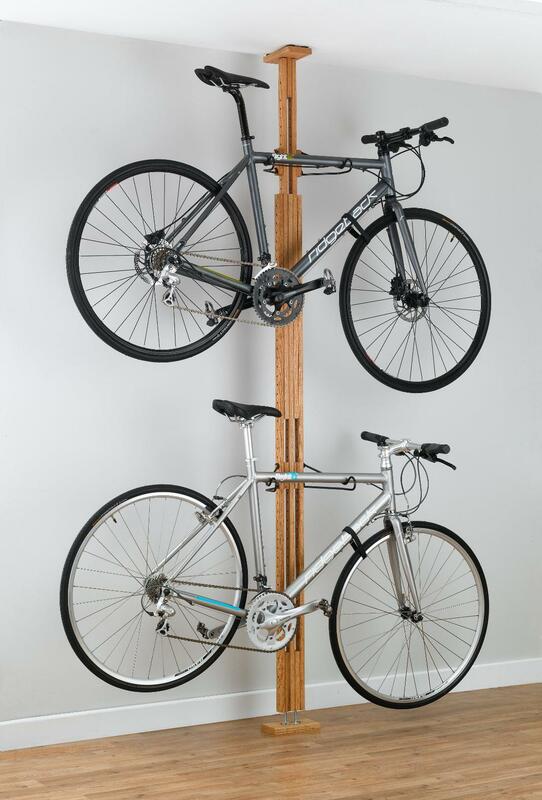 The OakRak Floor-to-Ceiling Bike Rack is made of furniture grade American Red Oak with a hand rubbed oil stain and finish. The solid oak top plate uses compression foam at each corner to protect the ceiling. The solid oak base plate provides stability on any surface to ensure a tight fit between the floor and ceiling. Velcro straps included to secure the front wheel to the frame of the bike so that the wheel does not swing side to side while being stored. 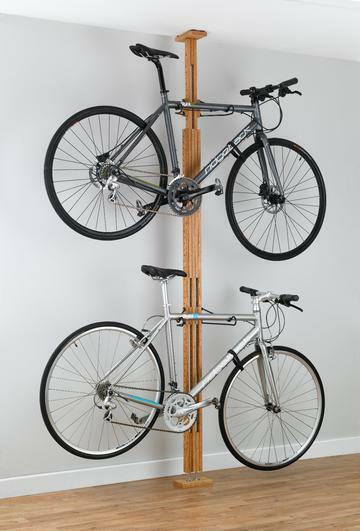 Carbon steel bike storage arms are vinyl coated to gently cradle the bike and protect the paint and finish. The storage arms adjust independently (up and down) to hold any style of bike. Comes complete with everything to store two bikes - add up to two additional bikes with oak Add-A-Bike kits. Adjusts to accommodate ceiling heights from 7ft to 10 ft. 200lb capacity. Assembled dimensions 7' to 10' tall, 14 ½" wide, and 9 ½" deep. Weighs 15 lbs.